It starts with the demonization of all who dare oppose President Obama and his obsessive claims of grandeur based on the presumption that President Barack Obama and Secretary of State John Kerry have avoided any possibility of war by bowing before Iran with the Iran nuclear deal known as the Joint Comprehensive Plan of Action (JCPA) and the equating of Republicans with the Mullahs and those Iranian hardliners who chant “Death to America” and “Death to Israel” and any others as Israel Firsters and treasonous people putting Israeli interests ahead of those of the President and thus the United States. These claims that the only alternative to the JCPA Iran Nuclear Deal is war and that those opposing this wondrous plan as simply like those who sided with Israel to drag the United States into the wars in Afghanistan and Iraq. There are a number of historical errors in this argument that need refuting before going on to the real argument that President Obama is making and the presumed lies which many in the media and throughout the political environment, especially backers of the President, especially some far leftist or die-hard committed Democrat Jews. First and foremost, neither Israel, Israelis or those who do hold fast to supporting Israel desired to draw the United States into any wars in the Middle East and especially into a war in Afghanistan. Perhaps President Obama was asleep or on an extended holiday somewhere where there is no news coverage of planet Earth on September 11, 2001 or he is simply using heated rhetoric to draw a contrast which makes all who oppose his Iran Nuclear Deal as foreign agents or those who would place foreign interests ahead of those of the United States. Perhaps if we were to investigate where President Obama stood on the United States involvement with the wars in Afghanistan and Iraq and the entire idea of bringing change to instill democracies instead of dictatorial powers in the Middle East first we could gain some insights. Candidate for Senate Barack Obama ran his campaign opposing the American presence in Afghanistan and Iraq as well as opposed to holding al Qaeda suspects at the prison on the Guantanamo Naval Base and when he ran for the Presidency a few years later he promised to end all three entities. Further, as President he ignored the advisings of the Joint Chiefs of Staff and almost all other military reports and intelligence and instead hurriedly pulled almost every American troop from Iraq which also saw every allies force pulled as well leaving a nation poorly suited and obviously not prepared or capable of maintaining its governance without an allied presence as a stabilizing force. The situation in Iraq was more tenuous staring failure in the face than were Germany and Japan at the end of World War II and those two nations to this day have a large contingence of American troops present within their borders though they no longer serve as the sole stabilizing force. Still, there are few calling for their being brought home as they are simply occupying those nations unnecessarily, though a better argument could be put forward for doing exactly that in reference to the troops in Japan and Germany. Additionally, after the attacks on the World Trade Center Towers, the Pentagon and the last plane being brought down by the passengers before it could be brought to its target suspected to have been in Washington D.C. and probably the White House or Capital Building that the United States needed no invitation to begin to chase the Taliban leaders in Afghanistan and all supporters of al-Qaeda also in the training camps in Afghanistan and where Osama Bin Laden had planned and trained the twenty hijackers for the September 11, 2001 attacks and thus start the war in Afghanistan. Further, Israel, if anything, was conspicuously absent from the coalition against Iraq and had Israel made any recommendations, they likely would have added removing the theocratic governance in Iran immediately after removing the sole check to Iranian designs on the entirety of the Middle East and North Africa, known as MENA in military jargon and as the Caliphate in historical and Islamic literature, Saddam Hussein in Iraq. The making Israel out to be the evil influence threatening the United States and attempting to topple the Presidency of the United States by interfering with the ratification of the nuclear deal with Iran is absurd. The claims that it is the hardliners in Iran and Israel who stand alone against this deal and are aiming to destroy the legacy of the President is equally absurd. And then comes the claims that the Israeli Prime Minister is acting out on his idea of the existence of a grudge match pitting the President as the evil entity when everybody knows that President Obama, as he has stated on numerous occasions even recently when pointing out how the Iran deal protected Israel unlike any previous agreement and was crafted with Israeli security in mind, has been the most stalwart and consistent friend Israel has ever had. The President has further pointed out that the only alternative, as Prime Minister Netanyahu has pointed out himself, to the JCPA, the Iran nuclear deal, is to go to war. Furthermore, there was the twisting of an invitation to address a joint session of Congress behind the President’s back working with an evil cabal of Republicans to work to marginalize President Obama and directly oppose the efforts of the President and instead instigate open warfare and the destruction of and semblance of order remaining in MENA nations. President Obama has pointed to all he has done and sacrificed and to how Benyamin Netanyahu has used every opportunity to upend and destroy their friendly relations the President has attempted to build between Israel and the United States. Well, let’s try and set the records straight. President Obama is feigning ignorance of the spiraling out of control venomous spite and hatred he has shown Prime Minister Netanyahu accusing him of forming a relationship to try to assist Presidential candidate Mitt Romney to win the election and defeat the sitting President, White House spokespeople accused Prime Minister Netanyahu of consistently coming out in favor of Romney and all but actively campaigning for Romney. One can check the records and they will prove that Prime Minister Netanyahu refused to take sides in the election and admitted to having had friendly relations with Romney and with President Obama. The Israeli Prime Minister has done all within his powers to play nice-nice with the President and has received constant attempts to pull the rug from beneath the Prime Minister by making startling announcements such as the belief of President Obama that the 1967 lines (the Green Line or 1949 Armistice Line) as the basis for the Palestinian State right as the Prime Minister was boarding the plane for a state visit. The animosities and brusque treatments suffered by the Israeli Prime Minister which include but are not limited to being made to use the back service entrance to meet and leave from meeting with President Obama, the refusal to hold a joint press meeting after their talks for the first three years of President Obama Presidency, leaving the Prime Minister by announcing he was going to go and have dinner with his family and then instructing the Prime Minister of Israel to meet with Netanyahu’s advisors who were present at a working meeting and to call for the President when they had finally decided to acquiesce to the demands put forth by President Obama; the Prime Minister was reported to have sat stunned for a few minutes before gathering himself and leaving the White House discreetly. Add to the items, and they are legion, of slights, insults and interventions including using political advisors and other assets in an active campaign to unseat the Prime Minister during the Israeli elections, and it is amazing that the Prime Minister has not taken a more adversarial role with President Obama. Even when Prime Minister Netanyahu was invited to speak before a joint session of Congress and had alerted the White House where the Prime Minister’s office had spoken with a representative of the White House who had presumably gotten back with the Israelis affirming the visit and speech only to pretend that they had never been given any warning or been included in the invitation process and were in a pique and felt very insulted and refused to meet with the Prime Minister during the visit and no White House representative attended the speech basically pretending that the Prime Minister was persona non grata as far as the President was concerned. Senator Schumer gestures his disapproval as being ‘this big’ as he tells President Obama that he will not be supporting the Iran Nuclear surrender, umm, I mean agreement. The singling out of Senator Schumer is troubling in a number of ways. Perhaps the most of these troubling parallels are those which can be drawn between the assaults made against Senator Schumer and those in the infamous affaires de Captain Alfred Dreyfus where an innocent Jewish officer in the service of the French military was scapegoated as the traitor who had sold information to the Germans, a deed actually committed by one of the General Staff and a man of rank and high privilege and family. 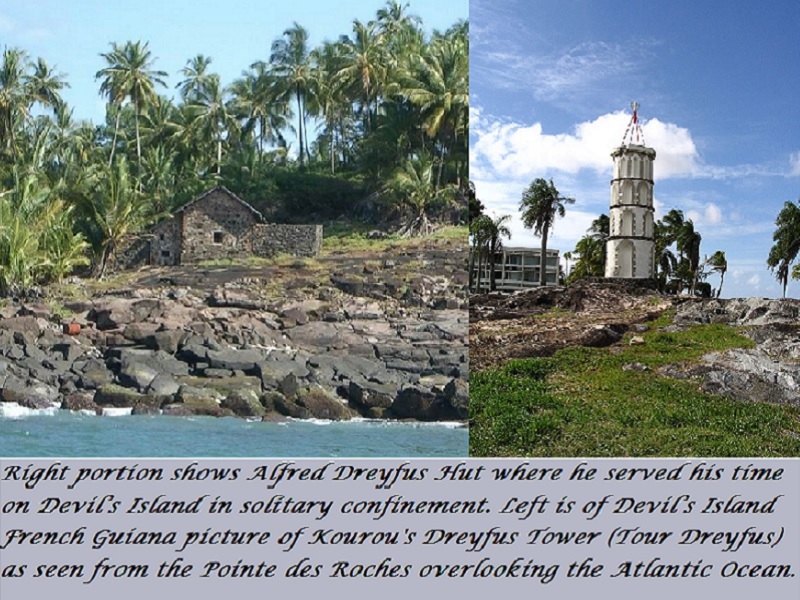 The accusations of treason were to find Captain Dreyfus guilty of treason and sentenced to life in prison of Devil’s Island in French Guiana. 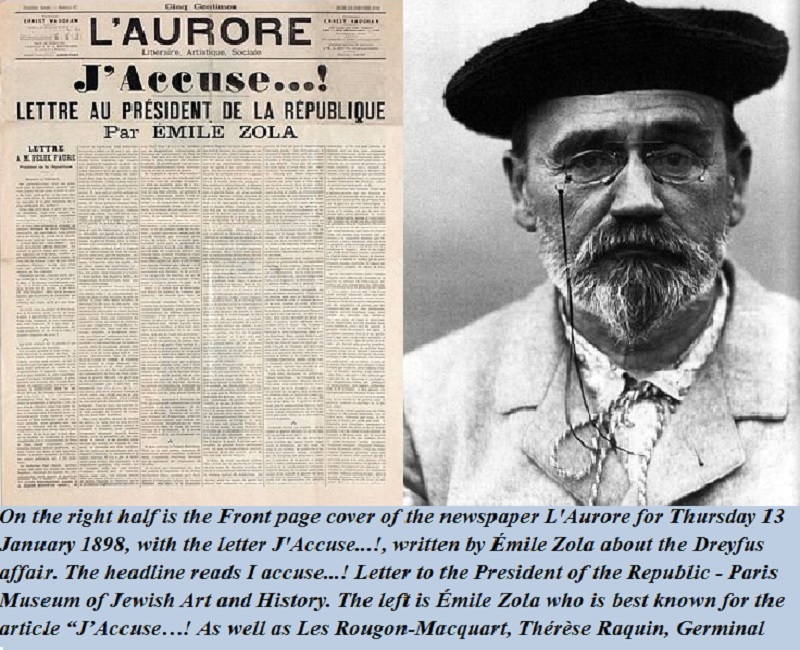 He was eventually released and even later cleared of all charges largely due to the efforts made by his wife Lucie and the works by Émile Zola of which his masterpiece proclamation “J’Accuse…!” pictured below with portrait of Émile Zola. 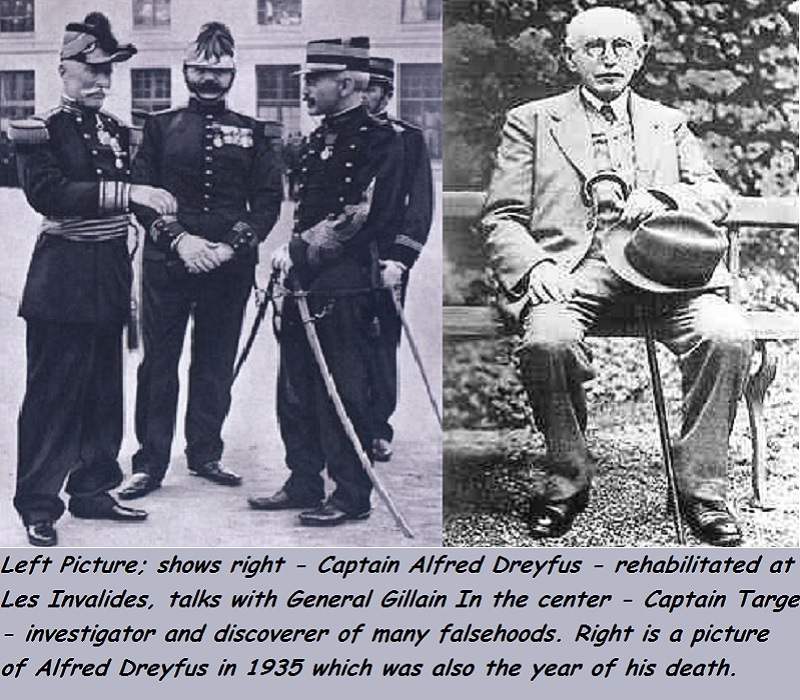 The additional pictures are of Captain Alfred Dreyfus’s reinstatement and portrait near the end of his life and one depicting the cell used to keep Captain Alfred Dreyfus in solitary confinement not permitted to converse even with the guards outside and the Dreyfus Tower erected in his honor at a high point overlooking the Atlantic Ocean. Fortunately for Senator Schumer Devil’s Island has long ceased to be utilized as a prison but he can visit as it has been made into a tourist spot. The depiction of Senator Schumer as being a turncoat, a traitor to his Party, a traitor to his President, and committing traitorous acts which will, according to those leveling both barrels on the Senator, bring his nation into a senseless and avoidable war. Senator Schumer has also been accused of basing his decision not on what would be good for his nation, not on what is possible instead of some perfect agreement which would only exist in some perfect world in a perfect reality, and worse still, sacrificing the young men and women who will have to fight this war all for a foreign nation, Israel. The singling out of Senator Schumer is not because he is casting a vote as a Democrat against the deal which, if we are to believe some mainstream media reports, a finely tuned and exquisitely worded document which had no loopholes, nor frayed edges and no strings dangling; it is a solid stand-alone agreement on limiting Iranian efforts to become a nuclear armed state which is so perfect that there is another whole deal which will supercede the stipulations in this deal with new stipulations in a secret deal which nobody has a right to view this part of the agreement and must simply take President Obama’s promises that it strengthens the original deal made by Secretary of State Kerry. The White House has not officially named who the team members were working to produce this super-secret agreement part deux. But it is Senator Schumer being targeted largely for obvious reasons, he is Jewish, he has a strong record of supporting Israel, he knows the Israeli Prime Minister, he has visited Israel more than once and even more than the President who is a self-proclaimed supporter and best friend of Israel who knows what is best for Israel more than the Israelis know what is good for Israel themselves which is also why the vast majority of Israelis have opposed the deal, confused yet? So, obviously Senator Schumer must be under the evil influences of those Israeli manipulators because the majority, even the majority in the opposition parties in the Knesset with their leader Labor Party Chairman Isaac Herzog met with Prime Minister Netanyahu and they shook hands, held a press briefing and both came out against the Iran Nuclear Deal. Many pro-Israel nationalists, Zionists and others all oppose this deal, the JCPA, even to including many who voted for President Obama not just once but twice. There are so many items included within the known sections of the agreement that have little to nothing to do with Iran becoming a nuclear weapons armed state as they will be going towards that full steam ahead deal or no deal. The problems come in with the ability for Iran to purchase as many weapons in as many types, styles, uses, and complexity, Iran being permitted to procure and then produce full range rockets capable of carrying satellites into space and warheads to any point on the globe, they can purchase mid-range missiles, arm Hezballah, arm the Houthis in Yemen, arm Hamas if they return to their former friends modality after some Hamas leaders meet with the Saudis and expand their reach in Central and South America and probably place more agents and provocateurs in the United States and potentially return Bashir al-Assad to power while the United States flies air support for Iranian troops in Iraq against ISIS and the Iranians have already bought air defense systems from Russia, the S-300 anti-aircraft-and-missile systems, plus a few aircraft such as one-hundred-fifty Chinese Chengdu J-10 sophisticated jet fighters with Israeli avionics and finally, two-hundred-fifty highly-advanced Russian Sukhoi-Su-30MK1 heavy-fighter-bombers as well as one-hundred IL78 MKI tanker aircraft; or simply put, Iran is purchasing an entire air force. Iran can purchase almost whatever variety of weapons they desire with the huge inflow of ready and hard cash and as it is in dollars which may be losing a fair amount of its buying power so they will likely buy it all now. What is there not to like about this great deal President Barack Hussein Obama and Secretary Jean François Kerry (spoken with a proper Parisian accent) have crafted over the last few years plus some indeterminate number of months, days, hours etcetera. They worked very hard with great fanfare meaning nothing to reach such an accord which will have little effect on Iran as anything Iran desires to include producing nuclear and thermonuclear warheads to their hearts’ content while the United States keeps calling for immediate inspections where suspicious activities have been detected by satellite pictures and other intelligence while the Iranians just continue doing as they please confident that there will be no unscheduled inspections. For there to be any inspection first one of the claimants, they are the United States, Iran, Russia, China, Great Britain, France, and Germany, can call for inspections which completes the initial step. Then Iran is petitioned and they can acquiesce or demand the committee decide if an unscheduled inspection is in order but if they are feeling particularly friendly the Iranians can skip the formalities and just allow the inspection. Should Iran demand a formal inspection then the committee of all of the P5+1 plus Iran and the European Union, how the European Union got in there is beyond me, I guess they just hung around and posed for so many pictures that it was simply taken for granted that they were also included somehow. The vote needs five of the eight votes in order for an inspection to take place but right off the top we realize that Iran will be voting against any inspections as will China, Russia. 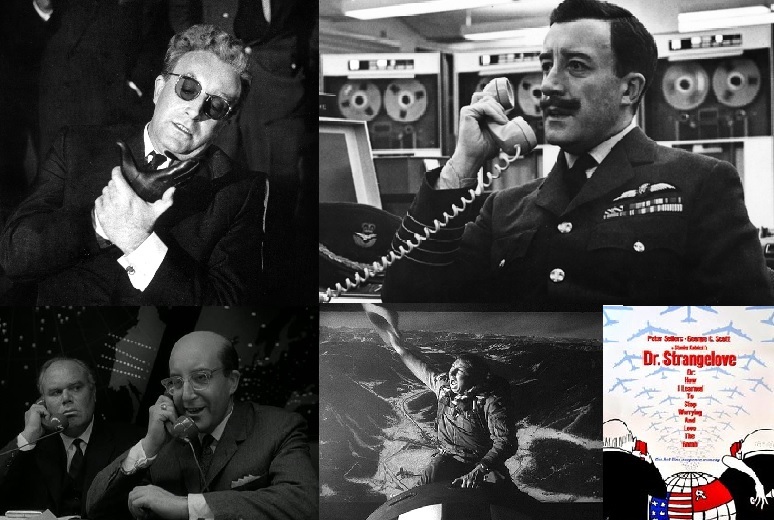 Let us further assume that the United States, Great Britain, and Germany all vote in favor. With the vote all tied at three to three and five votes required for a majority it makes the votes of France and the European Union to get vote in favor. We need to remember that even Germany is doubtful in reality once they build-up good trade relations and have lots of Euros invested then they are highly unlikely to vote against their cash cow. So even if only the French or the European Union vote against and snap inspection then there will be no inspection. So there will not even be snap inspections called and even if by some miracle there are five or more votes and inspections are called, then Iran can call for a delay of as much as twenty-four days and then another vote will end up being called for and such can happen that Iran might even delay a snap inspections plain and simple. Due to all the shortcomings of the JCPA which have been made known to the public and the public by a margin of two to one the public opposes the deal. The troubling reality is that as many of those polled there was almost half who claimed to not understand enough about the JCPA to make an informed statement either way. One of the most interesting, in an unnerving sort of way, revealed when asking whether or not Congress should vote for or against the JCPA, the Iran Nuclear Agreement, they preferred professing ignorance rather than give an opinion by a wide margin. The totals were Just over 1-in-4 (27%) say Congress should vote to approve it while 1-in-3(32%) say Congress should not, as a plurality (41%) are not sure what Congress should do. There was also this Quinnipiac University poll conducted July 23-28 of 1,644 registered voters, 57 percent oppose the deal compared to 28 percent who support it, a margin of exactly 2:1 against the JCPA Iran Deal. How does the White House come out and claim that any members of Congress who vote against the deal are stooges under the control of Israel and the Jewish Lobby? What is their reasoning other than to get a rise out of the people who agree with President Obama when the deal gets rejected, he vetoes the Congressional vote against this JCPA and then when it returns to Congress they muster the few additional votes and override his veto, what then? Is it the President’s plan to then use his phone and his pen calling for a solution to the problem of unfair influence by those Jews who forced Senator Schumer and other Jews and those owned by Jew money and influence that is destroying his America and they must be stopped, is that the ball game Mr. President? Is the entire reason your nuclear surrender to Iran being voted down by anybody who took the time to read the deal all a Jewish conspiracy and now you want the Jews stopped from interfering with your plans to change the Middle East as well as the United States? 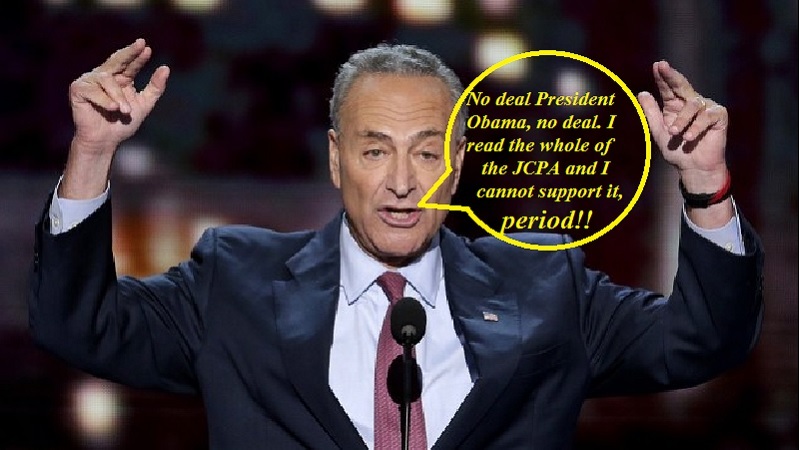 Well Mr. President, Senator Schumer read the publically available parts of the deal and was as in the dark as the rest of the Congress and the American people who all object to your super-secret further deal where, for all the people of the United States and their representatives in the House of Representatives and the Senate know, you probably gave away the farm and half the cities or made some crazed deal that you would not even let Secretary Kerry see which just makes everyone that much more suspicious and made rejecting the deal with the devil and by a devil a deal America does not want. Is the only reaction you can fall back on is the Jews prevented your greatest achievement? That is where you are in error as the Jews who are Israelis did not, in overwhelming numbers, accept the horrific deal you made which sold them down the river along with the United States and many fear that the United States will go first and then Israel will be left to avenge the ninety percent of Americans who will likely die after the electrical grid, which everybody ignored its vulnerability, will perish before your nation can right itself and that will leave Israel to hold back Iran and we all have to pray she has sufficient ability or Western civilization is going to die in ruins. That is why those who have read the JCPA reject it and reject it vigorously. It is not a Jew thing but a thinking person’s thing just like your ObamaCare would have died had anybody been given time to read and debate it. Fool us once, shame on you, but fool us twice then shame on us. I’m sorry, Mr. President, this is a bad deal and, wait a moment, maybe I’m not sorry, maybe I am finally serious as I read the deal and so did many others and just like if we had read the Affordable Care and Patient Protection Act, all the over a thousand pages we would have rejected it, but now we can reject your plan for the surrender of the world to Shia Islam, we say no!